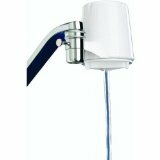 Which is the best faucet filter: Culligan, Brita or PUR? If your tap water smells of chlorine or has a bad taste it is time to think about a water filter. Faucet filters are a convenient choice if you live in a rented apartment and don't want to call in a plumber. They are also a good choice for families because there is no need to remember to refill or wait before the water passed the filter. The older models reviewed here may still be available online, but Brita and Pur have updated their systems in 2018. Read all about in my new review of the best faucet filter systems. Today I compare the Culligan FM-15A Advanced Faucet Filter Kit and the PUR Advanced Vertical Faucet Mount with the Brita On Tap Faucet Water Filter System. All three are NSF certified. No plumber or tools are needed to mount them to your kitchen faucet, which one is the best faucet mount filter system for your? The Culligan faucet filter is the cheapest of the three for the complete unit as well as for replacement filter cartridges. A filter change is recommended every two month, no matter if you used it to filter 200 gallon or not. With the cheapest replacements cartridges and the most gallon per cartridge this filter might be especially interesting for larger families. For smaller households with less water consumption per month the Brita filter could be a reasonable priced alternative. This filter lasts 4 month or 100 gallon. I like the LED that indicates the need for a filter change. The cheaper Culligan water filter only comes with a sticker and the more expensive PUR sports an electronic indicator. PUR cartridges contain minerals that are released into the water over time to improve taste and overall water quality. An outstanding feature of Brita water filtration system is the choice of flow options. You can choose if you want to use filtered water, spray or stream unfiltered water. The PUR faucet filter is the only one of the three contestants certified to reduce MTBE, a fuel additive, and Mercury. If you are concerned about these two chemicals in your water, the only alternative faucet mount water filter I know of is manufactured by DuPont. For me minerals and the ability to filter out MTBE and Mercury does not justify the relatively high price, especially when these contaminants are not in your water. After reading a lot of customer reviews and their complaints about leaking or breaking filter parts I assume that the idea to place the filter beside the faucet and thereby creating a lever might be the reason for a lot of problems with this type of design. New: Pur listened to the complaints. They have a new, improved model on the market. The older one is still available online, so beware which one you buy. Filter Life 200 gallons or 2 months, whichever comes first. 100 gallons or 4 months, whichever comes first. 100 gallons or 3 months, whichever comes first. The Brita complete faucet filtration system is a basic filter that allows to spray water. The Pur Advanced faucet filter with the mineral enhanced taste is the ideal choice if you are worried that you and your family do not drink enough water. The economical priced Culligan FM-15A advanced faucet filter seems a good choice for everyone who wants to enjoy cleaner, healthier water for a lower price per gallon.